If your idea of summer entertainment consists of sequels, prequels, and blockbusters, “Rose Cottages” at the Theatricum Botanicum in Topanga Canyon is probably not your cup of tea. If, however, your idea of summer entertainment includes out-of-doors presentations and a short drive that leaves you thinking you are in the country, you might want to try “Rose Cottages” at the enchanting Theatricum Botanicum, or one of the other productions they are presenting this summer in repertory. Playwright Bill Bozzone prides himself on finding humor in the ordinary. “Rose Cottages” is set in a decidedly downscale motel somewhere in central Florida. The cottages were inherited by Rose (Earnestine Phillips) whose husband is either on a trip or in prison, depending upon when and to whom she is telling the story. She has little hope or interest in improving the dilapidated state of her business, which is about to be shut down by the inspector. Fourteen-year-old Ldyell (Graco Hernandez), arrives on his skateboard, pretending to be 18, and insinuating himself into Rose’s establishment as a handyman. Rose is not convinced of either, but before she can muster the energy to kick him out some actual paying customers arrive. We humans tend to form tight groups or packs, whether it is kids at camp whose enemies become the other tent, or travelers who are thrown together, or people in an emergency situation. It is part of our means of survival. The meat of the “Rose Cottage” story is that the three abandoned souls, Jesse, Rose, and Lydell, end up more or less as a family: plenty of low-level friction but, in the end, more or less working together. The humor is in the interactions of these strange bedfellows. “Rose Cottages” is a slight work, entertaining, but not memorable. There are problems with the production. First and foremost is that the voices tend to be gobbled up by the outdoors venue, more so than generally happens at Theatricum. 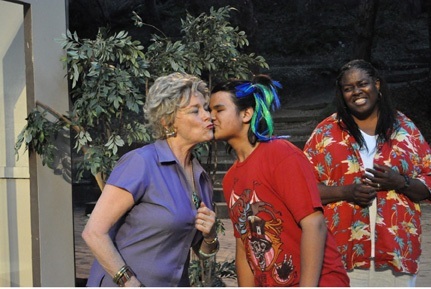 The part of Lydell, who in the original script was an AWOL soldier, was rewritten specifically for Hernandez, whom Geer (who is also Theatricum’s artistic director) discovered when she was judging a Shakespeare contest of kids from underprivileged schools. It is a stretch to imagine a 14-year-old in the part, and perhaps a larger role than the talented young Hernandez is quite ready for. All that aside, if blockbusters leave you cold, and a quick jaunt to charming Topanga with a picnic under the Theatricum’s sycamores sounds refreshing, “Rose Cottages” might be worth a try. Or, if something more classical would be more up your alley, try one of their other productions in repertory this summer, “Tartuffe,” “Midsummer’s Night Dream,” “The Merry Wives of Windsor,” or “Richard III.” Theatricum is a unique resource in the Los Angeles area and one that can give a dreary summer a boost; just don’t forget the seat cushions and a sweater.